Dear Liz Gilbert, ‘Eat Pray Love’ ruined everything. 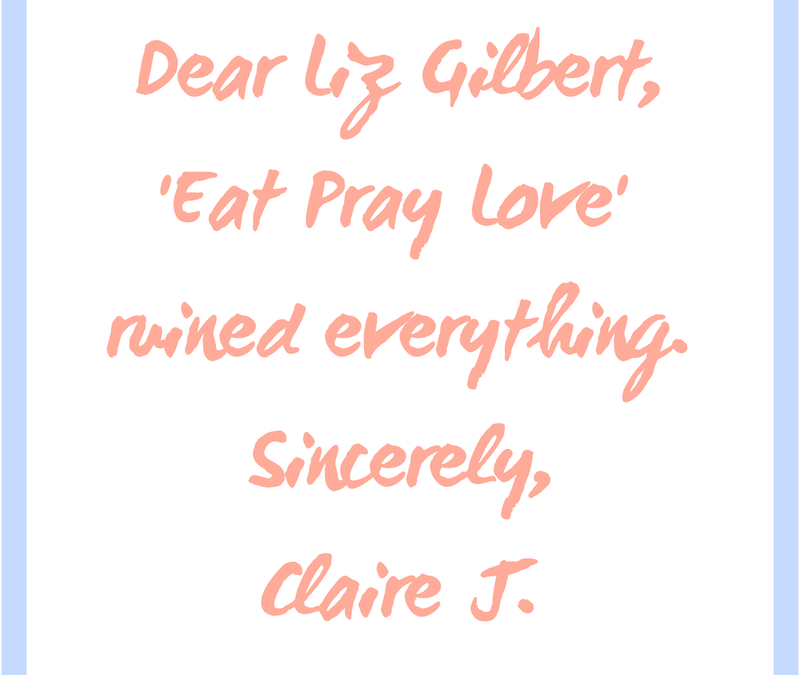 Dear Elizabeth Gilbert, You’re probably a lovely person but I just wanted to let you know that Eat, Pray, Love ruined everything. I’m glad you found yourself and your handsome Brazilian after what sounds like a painful divorce. I accept that millions of readers have been inspired by your soul searching, even if I was not – so I’ll get straight to the point. Liz, your book is marketed as a travel memoir. In fact, it is marketed as THE travel memoir for women. To be fair, I understand how marketing works and that you may have had nothing to do with this. But you’ve still ruined things for the rest of us. By us, I’m referring to an admittedly small group of women who’ve written our own manuscripts that, whether or not we want them to, publishers slap the label “travel memoir” on to – which means we automatically get compared to your bestseller. And, by extension, to the Julia Roberts movie where it takes her a quarter of the film to even leave America. Liz, we’re compared to you simply because we’re women. I’m not saying your pseudo-spiritual claptrap isn’t well-written and even entertaining in parts, depending on whether a reader is into long-winded descriptions of God and prayer and how the universe manifests what you’re seeking. * *(If you’re a rather privileged white woman from a western country with a passport that allows you to cross borders and enough in your bank account to not work for a year.) Liz, you can probably tell I’m not a great believer in getting things just because you’ve prayed for them. I’ve travelled in far too many poverty-stricken countries to see how that could possibly be true. Oh that’s right, so have you. Liz, I get that you wrote a book set in Italy and India and Indonesia which tells us next to nothing about Italians, Indians or Indonesians. If you wanted to meet Indians you would have set foot outside of the ashram, after all. It wasn’t even that your descriptions of the Americans and Australians and Europeans populating your travels didn’t grab me – it’s just that now publishers seem to think that’s what travel is. FOR WOMEN. Liz, I pitched my manuscript to a publisher the other day and they asked me “What’s your spiritual journey? What did you learn about yourself? Is it the next Eat Pray Love?” She actually apologised for asking the last question, but she asked it anyway. Liz, I wonder whether male travel writers get asked if they found themselves. I had to google Bill Bryson to find out if he was married. And I’ve read plenty of his books. They’re all about travel, you see. Men don’t need to have an epiphany or fall in love while travelling to write a book that people will read. But not us, Liz. Not the women writers. Even though women have been reading about men travelling for centuries, female travel memoirs will apparently only be read by women. And APPARENTLY women readers only want to eat, pray and love. Liz, I would like to rejoice in every female writer’s success, I really would. The problem is, you showed us that women could sell travel books, just as long as those books weren’t really about travel. So thanks Liz. You ruined everything.